As the hatchback cousin to the Nissan Versa, the all-new Versa Note looks almost exactly the same, with a hatchback rear attached. 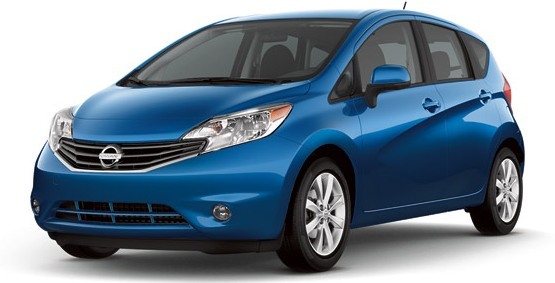 A funky front design leads to the rear with beautifully sculpted bodylines that enhance the Versa Note’s funky vibe. The rear spoiler and modern back design adds a bit of a sporty aspect to the car, making it perfect for active individuals who want to show off a unique car. Not necessarily built for speed, the 2014 Note isn’t going to surprise you with its 1.6-liter four-cylinder engine, which produces 199 horsepower and 107 lb-ft of torque. It will, however, make your commute to work fun, hugging corners and handling with ease. The EPA-estimated 30 mpg combined makes the Note great for any commuter looking to get from point A to point B with the least amount of gas possible. For such a compact car, the amount of room within the cabin is really surprising. The Divide-N-Hide adjustable floor allows you to create some interesting storage situations in the back, giving you the ability to fold down the 60/40 split seats and create a convenient loading platform. It also features the only Around View Monitor in its class, along with the available Hands-free texting and calling, iPhone integration, Pandora radio capability, and Bluetooth streaming audio. While the quality of the materials isn’t exactly the greatest, the simple design makes sure everything is easily in reach and easy to use. Along with standard safety features, such as antilock brakes and a variety of airbags, the SV trim level also comes with an optional rearview camera and a standard tire-pressure alert system.